For other uses, see Biosphere (disambiguation). A false-color composite of global oceanic and terrestrial photoautotroph abundance, from September 2001 to August 2017. Provided by the SeaWiFS Project, NASA/Goddard Space Flight Center and ORBIMAGE. The biosphere (from Greek βίος bíos "life" and σφαῖρα sphaira "sphere") also known as the ecosphere (from Greek οἶκος oîkos "environment" and σφαῖρα), is the worldwide sum of all ecosystems. It can also be termed the zone of life on Earth, a closed system (apart from solar and cosmic radiation and heat from the interior of the Earth), and largely self-regulating. By the most general biophysiological definition, the biosphere is the global ecological system integrating all living beings and their relationships, including their interaction with the elements of the lithosphere, geosphere, hydrosphere, and atmosphere. The biosphere is postulated to have evolved, beginning with a process of biopoiesis (life created naturally from non-living matter, such as simple organic compounds) or biogenesis (life created from living matter), at least some 3.5 billion years ago. The term "biosphere" was coined by geologist Eduard Suess in 1875, which he defined as the place on Earth's surface where life dwells. While the concept has a geological origin, it is an indication of the effect of both Charles Darwin and Matthew F. Maury on the Earth sciences. The biosphere's ecological context comes from the 1920s (see Vladimir I. Vernadsky), preceding the 1935 introduction of the term "ecosystem" by Sir Arthur Tansley (see ecology history). Vernadsky defined ecology as the science of the biosphere. It is an interdisciplinary concept for integrating astronomy, geophysics, meteorology, biogeography, evolution, geology, geochemistry, hydrology and, generally speaking, all life and Earth sciences. Geochemists define the biosphere as being the total sum of living organisms (the "biomass" or "biota" as referred to by biologists and ecologists). In this sense, the biosphere is but one of four separate components of the geochemical model, the other three being geosphere, hydrosphere, and atmosphere. When these four component spheres are combined into one system, it is known as the Ecosphere. This term was coined during the 1960s and encompasses both biological and physical components of the planet. The Second International Conference on Closed Life Systems defined biospherics as the science and technology of analogs and models of Earth's biosphere; i.e., artificial Earth-like biospheres. Others may include the creation of artificial non-Earth biospheres—for example, human-centered biospheres or a native Martian biosphere—as part of the topic of biospherics. The earliest evidence for life on Earth includes biogenic graphite found in 3.7 billion-year-old metasedimentary rocks from Western Greenland and microbial mat fossils found in 3.48 billion-year-old sandstone from Western Australia. More recently, in 2015, "remains of biotic life" were found in 4.1 billion-year-old rocks in Western Australia. In 2017, putative fossilized microorganisms (or microfossils) were announced to have been discovered in hydrothermal vent precipitates in the Nuvvuagittuq Belt of Quebec, Canada that were as old as 4.28 billion years, the oldest record of life on earth, suggesting "an almost instantaneous emergence of life" after ocean formation 4.4 billion years ago, and not long after the formation of the Earth 4.54 billion years ago. According to biologist Stephen Blair Hedges, "If life arose relatively quickly on Earth ... then it could be common in the universe." 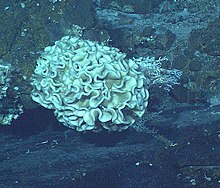 Xenophyophore, a barophilic organism, from the Galapagos Rift. Every part of the planet, from the polar ice caps to the equator, features life of some kind. Recent advances in microbiology have demonstrated that microbes live deep beneath the Earth's terrestrial surface, and that the total mass of microbial life in so-called "uninhabitable zones" may, in biomass, exceed all animal and plant life on the surface. The actual thickness of the biosphere on earth is difficult to measure. Birds typically fly at altitudes as high as 1,800 m (5,900 ft; 1.1 mi) and fish live as much as 8,372 m (27,467 ft; 5.202 mi) underwater in the Puerto Rico Trench. There are more extreme examples for life on the planet: Rüppell's vulture has been found at altitudes of 11,300 m (37,100 ft; 7.0 mi); bar-headed geese migrate at altitudes of at least 8,300 m (27,200 ft; 5.2 mi); yaks live at elevations as high as 5,400 m (17,700 ft; 3.4 mi) above sea level; mountain goats live up to 3,050 m (10,010 ft; 1.90 mi). Herbivorous animals at these elevations depend on lichens, grasses, and herbs. 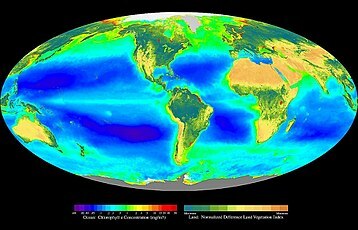 Life forms live in every part of the Earth's biosphere, including soil, hot springs, inside rocks at least 19 km (12 mi) deep underground, the deepest parts of the ocean, and at least 64 km (40 mi) high in the atmosphere. Microorganisms, under certain test conditions, have been observed to survive the vacuum of outer space. The total amount of soil and subsurface bacterial carbon is estimated as 5 × 1017 g, or the "weight of the United Kingdom". The mass of prokaryote microorganisms—which includes bacteria and archaea, but not the nucleated eukaryote microorganisms—may be as much as 0.8 trillion tons of carbon (of the total biosphere mass, estimated at between 1 and 4 trillion tons). Barophilic marine microbes have been found at more than a depth of 10,000 m (33,000 ft; 6.2 mi) in the Mariana Trench, the deepest spot in the Earth's oceans. In fact, single-celled life forms have been found in the deepest part of the Mariana Trench, by the Challenger Deep, at depths of 11,034 m (36,201 ft; 6.856 mi). Other researchers reported related studies that microorganisms thrive inside rocks up to 580 m (1,900 ft; 0.36 mi) below the sea floor under 2,590 m (8,500 ft; 1.61 mi) of ocean off the coast of the northwestern United States, as well as 2,400 m (7,900 ft; 1.5 mi) beneath the seabed off Japan. Culturable thermophilic microbes have been extracted from cores drilled more than 5,000 m (16,000 ft; 3.1 mi) into the Earth's crust in Sweden, from rocks between 65–75 °C (149–167 °F). Temperature increases with increasing depth into the Earth's crust. The rate at which the temperature increases depends on many factors, including type of crust (continental vs. oceanic), rock type, geographic location, etc. The greatest known temperature at which microbial life can exist is 122 °C (252 °F) (Methanopyrus kandleri Strain 116), and it is likely that the limit of life in the "deep biosphere" is defined by temperature rather than absolute depth. On 20 August 2014, scientists confirmed the existence of microorganisms living 800 m (2,600 ft; 0.50 mi) below the ice of Antarctica. According to one researcher, "You can find microbes everywhere — they're extremely adaptable to conditions, and survive wherever they are." Our biosphere is divided into a number of biomes, inhabited by fairly similar flora and fauna. On land, biomes are separated primarily by latitude. Terrestrial biomes lying within the Arctic and Antarctic Circles are relatively barren of plant and animal life, while most of the more populous biomes lie near the equator. On land, vegetation appears on a scale from brown (low vegetation) to dark green (lots of vegetation); at the ocean surface, phytoplankton are indicated on a scale from purple (low) to yellow (high). This visualization was created with data from satellites including SeaWiFS, and instruments including the NASA/NOAA Visible Infrared Imaging Radiometer Suite and the Moderate Resolution Imaging Spectroradiometer. Biosphere 2 in Arizona, United States, 3.15 acres (13,000 m2). BIOS-1, BIOS-2 and BIOS-3 at the Institute of Biophysics in Krasnoyarsk, Siberia, in what was then the Soviet Union. Biosphere J (CEEF, Closed Ecology Experiment Facilities), an experiment in Japan. No biospheres have been detected beyond the Earth; therefore, the existence of extraterrestrial biospheres remains hypothetical. The rare Earth hypothesis suggests they should be very rare, save ones composed of microbial life only. On the other hand, Earth analogs may be quite numerous, at least in the Milky Way galaxy, given the large number of planets. Three of the planets discovered orbiting TRAPPIST-1 could possibly contain biospheres. Given limited understanding of abiogenesis, it is currently unknown what percentage of these planets actually develop biospheres. Based on observations by the Kepler Space Telescope team, it has been calculated that provided the probability of abiogenesis is higher than 1 to 1000, the closest alien biosphere should be within 100 light-years from the Earth. It is also possible that artificial biospheres will be created during the future, for example on Mars. The process of creating an uncontained system that mimics the function of Earth's biosphere is called terraforming. ^ The Columbia Encyclopedia, Sixth Edition. Columbia University Press. 2004. Retrieved 2010-11-12. ^ a b Campbell, Neil A.; Brad Williamson; Robin J. Heyden (2006). Biology: Exploring Life. Boston, Massachusetts: Pearson Prentice Hall. ISBN 978-0-13-250882-7. ^ Zimmer, Carl (3 October 2013). "Earth's Oxygen: A Mystery Easy to Take for Granted". The New York Times. Retrieved 3 October 2013. ^ "Meaning of biosphere". WebDictionary.co.uk. WebDictionary.co.uk. Retrieved 2010-11-12. ^ Suess, E. (1875) Die Entstehung Der Alpen [The Origin of the Alps]. Vienna: W. Braunmuller. ^ Möller, Detlev (December 2010). Chemistry of the Climate System. De Gruyter. pp. 118–119. ISBN 978-3-11-022835-9. ^ Bebarta, Kailash Chandra (2011). Dictionary of Forestry and Wildlife Science. New Delhi: Concept Publishing Company. p. 45. ISBN 978-81-8069-719-7. ^ Noffke, Nora; Christian, Daniel; Wacey, David; Hazen, Robert M. (8 November 2013). "Microbially Induced Sedimentary Structures Recording an Ancient Ecosystem in the ca. 3.48 Billion-Year-Old Dresser Formation, Pilbara, Western Australia". Astrobiology. 13 (12): 1103–24. Bibcode:2013AsBio..13.1103N. doi:10.1089/ast.2013.1030. PMC 3870916. PMID 24205812. ^ Bell, Elizabeth A.; Boehnike, Patrick; Harrison, T. Mark; et al. (19 October 2015). "Potentially biogenic carbon preserved in a 4.1 billion-year-old zircon" (PDF). Proc. Natl. Acad. Sci. U.S.A. 112 (47): 14518–21. Bibcode:2015PNAS..11214518B. doi:10.1073/pnas.1517557112. ISSN 1091-6490. PMC 4664351. PMID 26483481. Retrieved 2015-10-20. Early edition, published online before print. ^ Dodd, Matthew S.; Papineau, Dominic; Grenne, Tor; Slack, John F.; Rittner, Martin; Pirajno, Franco; O'Neil, Jonathan; Little, Crispin T. S. (2 March 2017). "Evidence for early life in Earth's oldest hydrothermal vent precipitates" (PDF). Nature. 343 (7643): 60–64. Bibcode:2017Natur.543...60D. doi:10.1038/nature21377. PMID 28252057. ^ Ghosh, Pallab (1 March 2017). "Earliest evidence of life on Earth 'found". BBC News. Retrieved 2 March 2017. ^ a b University of Georgia (25 August 1998). "First-Ever Scientific Estimate Of Total Bacteria On Earth Shows Far Greater Numbers Than Ever Known Before". Science Daily. Retrieved 10 November 2014. ^ Hadhazy, Adam (12 January 2015). "Life Might Thrive a Dozen Miles Beneath Earth's Surface". Astrobiology Magazine. Retrieved 11 March 2017. ^ Fox-Skelly, Jasmin (24 November 2015). "The Strange Beasts That Live In Solid Rock Deep Underground". BBC online. Retrieved 11 March 2017. ^ Zhang, K. Dose; A. Bieger-Dose; R. Dillmann; M. Gill; O. Kerz (1995). A. Klein, H. Meinert, T. Nawroth, S. Risi, C. Stride. "ERA-experiment "space biochemistry"". Advances in Space Research. 16 (8): 119–129. Bibcode:1995AdSpR..16..119D. doi:10.1016/0273-1177(95)00280-R. PMID 11542696. ^ Vaisberg, Horneck G; Eschweiler U; Reitz G; Wehner J; Willimek R; Strauch K. (1995). "Biological responses to space: results of the experiment "Exobiological Unit" of ERA on EURECA I". Adv. Space Res. 16 (8): 105–18. Bibcode:1995AdSpR..16..105V. doi:10.1016/0273-1177(95)00279-N. PMID 11542695. ^ Takamia; et al. (1997). "Microbial flora in the deepest sea mud of the Mariana Trench". FEMS Microbiology Letters. 152 (2): 279–285. doi:10.1111/j.1574-6968.1997.tb10440.x. PMID 9231422. ^ Szewzyk, U; Szewzyk, R; Stenstrom, TR. (1994). "Thermophilic, anaerobic bacteria isolated from a deep borehole in granite in Sweden". Proceedings of the National Academy of Sciences of the USA. 91 (5): 1810–1813. Bibcode:1994PNAS...91.1810S. doi:10.1073/pnas.91.5.1810. PMC 43253. PMID 11607462. ^ Salisbury FB; Gitelson JI; Lisovsky GM (Oct 1997). "Bios-3: Siberian experiments in bioregenerative life support". BioScience. 47 (9): 575–85. doi:10.2307/1313164. JSTOR 1313164. PMID 11540303. ^ Nakano; et al. (1998). "Dynamic Simulation of Pressure Control System for the Closed Ecology Experiment Facility". Transactions of the Japan Society of Mechanical Engineers. 64 (617): 107–114. doi:10.1299/kikaib.64.107. ^ "Institute for Environmental Sciences". Ies.or.jp. Retrieved 2011-11-08. ^ Ward, Peter D.; Brownlee, Donald (2004). Rare earth: why complex life is uncommon in the universe (2nd rev. ed.). New York: Copernicus. ISBN 978-0-387-95289-5. ^ Choi, Charles Q. (21 March 2011). "New Estimate for Alien Earths: 2 Billion in Our Galaxy Alone". Space.com. Retrieved 25 September 2017. ^ Rees, Sir Martin (22 February 2017). "These new worlds are just the start. There are many more life-supporting planets out there waiting to be discovered". The Telegraph. Retrieved 25 September 2017. ^ Clarke, Robert Zubrin ; With Richard Wagner ; Foreword by Arthur C (2011). The Case for Mars: The Plan to Settle the Red Planet and Why We Must (Rev., Updated ed.). Simon & Schuster. ISBN 978-1451608113. ^ Fogg, M.J. (1998). "Terraforming Mars: A review of current research". Advances in Space Research. 22 (3): 415–420. Bibcode:1998AdSpR..22..415F. doi:10.1016/S0273-1177(98)00166-5. ISSN 0273-1177. The Biosphere (A Scientific American Book), San Francisco, W.H. Freeman and Co., 1970, ISBN 0-7167-0945-7. This book, originally the December 1970 Scientific American issue, covers virtually every major concern and concept since debated regarding materials and energy resources (including solar energy), population trends, and environmental degradation (including global warming). Look up biosphere in Wiktionary, the free dictionary. Paul Crutzen Interview, freeview video of Paul Crutzen Nobel Laureate for his work on decomposition of ozone talking to Harry Kroto Nobel Laureate by the Vega Science Trust.